Hold on to your bookcase. You're in for a wild ride. I have to admit that when I first started reading this I felt mostly confused, and due to that fact probably also a bit disinterested. It felt like the reading experience went slow and perhaps it was, because this is not a book that you can breeze through and still understand everything. It's a clever book, which doesn't mean you're stupid when you don't understand it or like it, mind you. Nobody reads the same book when reading the same book. 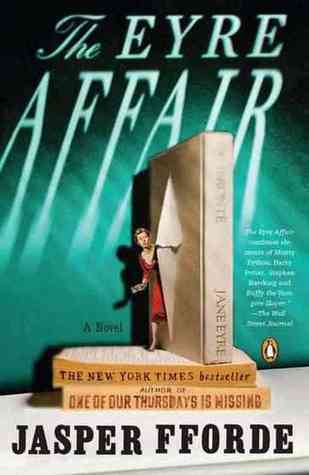 It's clever in the way that the world of the Eyre Affair is weaved together. But it took me a moment to 'get' it. I had actually stopped reading this book for a while, but I picked it up yesterday and finished it today. I mean wow. The second time I picked it up, I just...kind of...fell in love with it. The main character is Thursday and she is awesome. She stands up for what she believes in, has humour, and most importantly, is human. Not that I don't love me some supernatural characters, but I mean that she is realistic, emotional, flawed. All things I order along with a main character. There were two minor issues. There's a contradiction when she expresses surprise that someone is not excited about her plan and then two lines later she figured he would say something like that. Also, she realises which novel will be stolen, but doesn't say anything until she gets the call that it has been stolen. If she knew, then why didn't she tell them to add extra security? Those are the only things that irked me. The plot is interesting because it's not like a murder needs solving and you don't figure it out till the end. It's more like a cat-and-mouse game. The only jarring thing, and this is my only main issue with the book, is that the bad guy is a flat MUAHAHAHA evil character. He is supposed to be because he's half demon, I believe, and does not like his human half. However, he does what the story needs him to do: bad things. It is such a creative novel. So why not take a little holiday and dive into this one? The characters would love the company.